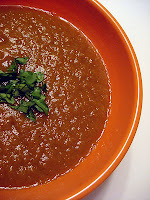 Vegetarian Cookster: Sweet-Hot Pumpkin Soup ... veganized! If you like your pumpkin with punch, then have I got a soup for you! This is a recipe I found in a non-vegetarian crockpot book. It seemed easy enough to veganize--I replaced the chicken broth with veggie broth, and the three tablespoons honey became three tablespoons agave nectar. The book says it serves five to six people. It took me about 20 minutes to prep the ingredients for the slow cooker. I saved a bit of time by using packaged shredded carrots instead of peeling and chopping my own. This cooked all day (nine hours) in the crockpot without crusting up the sides. :) I have leftovers for lunches later in the week... good thing, too, because it's supposed to get cold 'round these parts. Up next: a lentil stew in the crockpot. Mmmm as you know, I love pumpkin! It's not cold here right now, but who cares? Any time is a good time for pumpkin soup! Mmm, that has some really fun ingredients you don't usually see with pumpkin! I like you, am a wuss when it comes to chilli, but I am trying to add it more. Wow this looks insanely good! Yum! Perfect perfect for the season!